We are profoundly grateful to all of our cast, players, production team, patrons, and donors who made our first production a great success. Now we move on to planning for our 2019 production as our selection committee ponders what is next for EChO. Sign up for our email newsletter and be one of the first to learn about it! (Right: the Smalls Lighthouse as it appears today from a few miles away; photo by Catherine Davis, from Wikimedia Commons). For the means to live. The ships go heaving past! High o’er the silver sources of the rain. 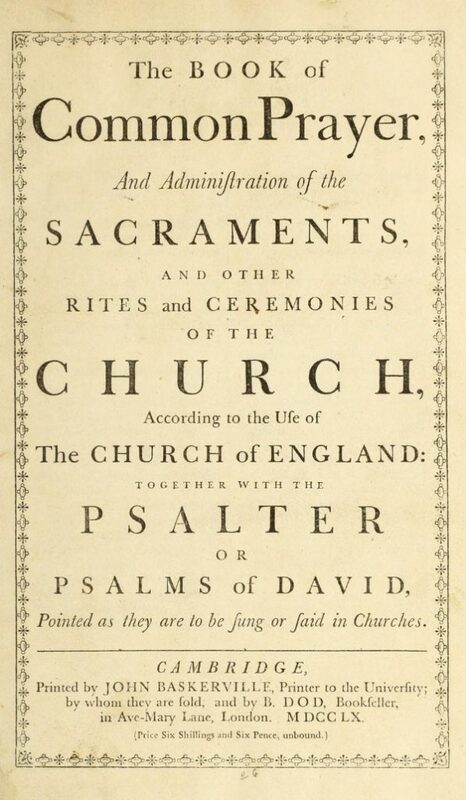 The Book of Common Prayer contains the order of worship for churches that are part of the Anglican Communion, offshoots of the Church of England. It also contains a number of prayers designed for inclusion in a service or for private use, two of which are set to music in For Those in Peril. “Keep watch” is traditionally used in the evening service known as compline; in the opera it is sung by Madeleine Griffith before she goes to bed. The other prayer is dedicated to loved ones, who for whatever reason, are far away. It is sung as a duet by Gwendolyn Howell and Madeleine Griffith as they await news of their husbands. O God, whose fatherly care reaches to the uttermost parts of the earth: We humbly beseech Thee graciously to behold and bless those whom we love, now absent from us. Defend them from all dangers of soul and body; and grant that both they and we, drawing nearer to Thee, may be bound together by Thy love in the communion of the Holy Spirit, and in the fellowship of Thy saints; through Jesus Christ our Lord. Amen. All of the music in the opera was written by composer Francis Lynch, with two exceptions. 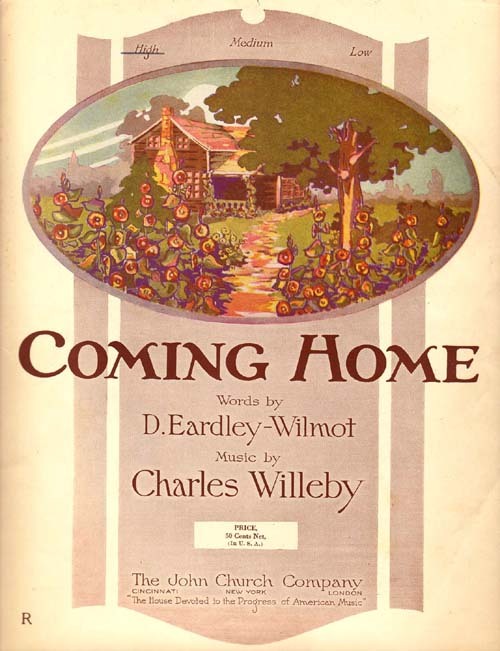 Both pieces appear just before the end of the opera and share a common theme: homecoming. A capstan chanty was sung by sailors as they toiled to wind the capstan, a large winch used to bring up the anchor. In the early 20th century, a number of British composers went into rural Britain to collect folk tunes. This one, titled “Homeward Bound”, was collected by Cecil Sharpe in 1914 from a 76-year-old resident of Crowcombe. Lynch arranged the music as a trio for tenor, baritone, and bass. Charles Willeby (1865-1955) was a composer of art songs, poetic texts set to music for voice and piano. There is relatively little known about him and even less about the author of the text of “Coming Home,” D. Eardley-Wilmot. But the text is poignant and seemed perfectly suited to the hopes of the keepers’ wives when they learn of the likely return of their husbands. Lynch arranged the music as a duet for them, the last music they sing in the opera. There is many an eye grows brighter, coming home. To dear distant days behind you, coming home! It will wait until the morrow, coming home. Oh! the longing and the dreaming, coming home. “I’ll save the crew,” she cried. Of the men of the shipwrecked crew. As the raging storm she braved. And the stranded crew she saved. The seas like mountains rolled. Cried Grace, “Come help me, father, To launch the boat,” said she. And reached the rock at length. In heaven alone their strength. Who nobly saved that crew. Off the Northumberland coast of England in 1841, a paddlesteamer ran aground on the Farne Islands. 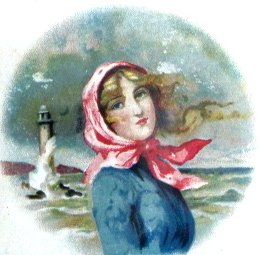 The daughter of the lighthouse keeper at the Longstone Lighthouse, Grace Darling, insisted that she and her father row a boat out to rescue nine of the crew members, despite raging seas. She quickly became a folk heroine, and the anonymous ballad shown at left appeared soon after the event. In For Those in Peril, composer Francis Lynch has set these words to a new melody and crafted a duet that becomes another incident in the history of the bad blood between Howell and Griffith. William Whiting (1825-1878), an Anglican churchman from Winchester, England, wrote this hymn in 1860 after a violent storm nearly wrecked the ship he was travelling on. 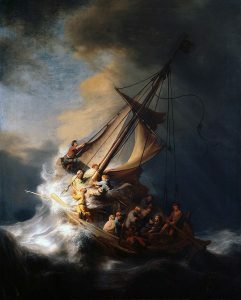 Versions of it were adopted by many branches of the armed forces of Britain and the USA, and it has become known as the “Naval Hymn.” The best-known tune for the hymn was written by English composer J.B. Dykes in 1861, but in the opera it is set to new music by Francis Lynch, who considers it a masterpiece of hymn writing in its clever rhymes and Biblical references. 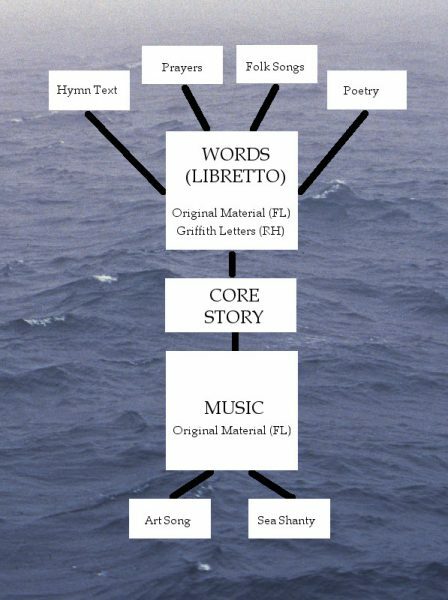 What goes into an opera? For Those in Peril is mostly made of pieces the composer and the librettists invented, but it also includes a famous hymn text; two prayers from the Book of Common Prayer; a folk song text; a traditional sea shanty; an art song (both words and music); and words from a variety of 19th century poets. In our next set of blog posts, we’ll look more closely at these added ingredients and fill you in on the background of their creators. ...poor Griffith breathed his last; then perhaps, commenced the worst chapter in the surviving Light-keeper’s experience of that sad time. Decomposition would quickly follow; and the “body of death” would vitiate the atmosphere of the too confined apartment. The body could not be thrown, to find its grave, into the sea; suspicion with her thousand tongues would point at Howell as the author of foul play – that to hide a lesser fault he had committed the greater one of murder! Howell’s skill as a cooper, enabled him to make a coffin for his dead companion, out of boards obtained from a bulk-head in the dwelling apartment. After a great deal of labour the body was carried to the platform and firmly secured to the railing. For three weeks – weeks apparently as long as months – it occupied this position, before the weather moderated. A Milford boat at last landed two Light-keepers, and brought away Howell and the body of his companion… Howell’s attenuated form demonstrated the sufferings, both mental and physical, he had undergone; his friends, in some instances, failed to recognize him on his return home. Four months in such a place, and under such circumstances, what would it not effect? Mr Whiteside from this calamity, wisely determined that three Light-keepers should inhabit the structure at the same time; and three continue to be the number employed hitherto. 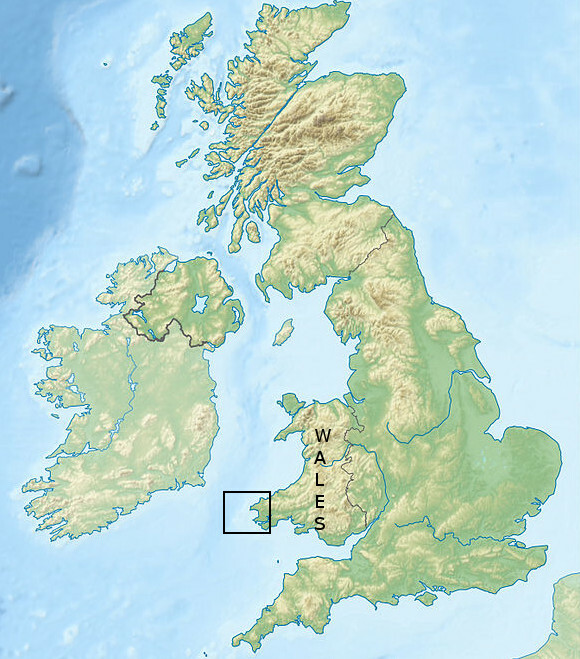 The events of For Those in Peril take place in the westernmost portion of Wales, part of the United Kingdom on the island of Great Britain. Much of the action takes place at a lighthouse on the largest of a group of wave-washed rocks known as The Smalls, about 20 miles off the coast. 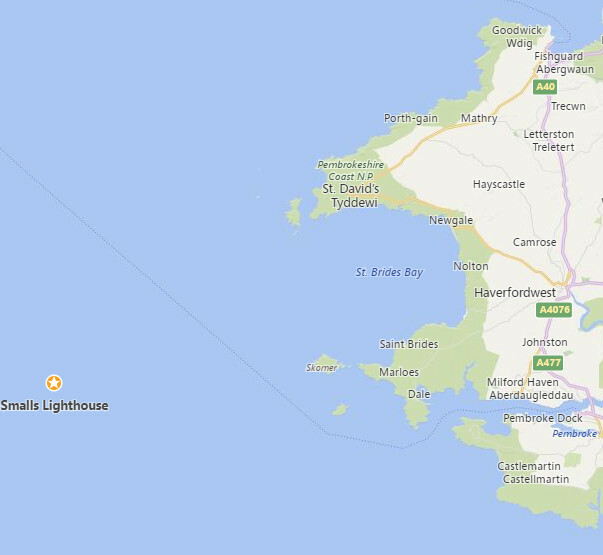 The map below is an expansion of the highlighted area in the map above. The action on shore takes place in an unspecified village in Mathry Parish, part of the county of Pembrokeshire. The village of Mathry can be seen toward the upper right of the map above. The lighthouse in the opera was the first to be erected on The Smalls, in 1775, by a Liverpool instrument maker named Henry Whiteside, who appears as a character in the opera. His design, using nine oak pillars to support the lighthouse, allowed waves to pass through below the structure. 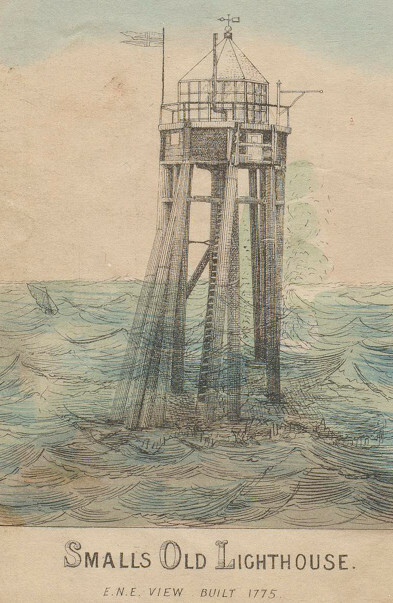 The illustration above is from an 1859 book describing the history of the original lighthouse, which was replaced in 1861 by a more conventional stone tower. We’ll have more background on the opera in future posts!